If you love gyro sandwiches, you'll really enjoy these burgers. These can be served in warmed pitas or toasted hamburger buns. The choice is yours. Combine ground lamb with the next eight ingredients. Divide into four equal parts and form into patties. Set aside (or if making earlier in the day, cover and place into refrigerator). For sauce: Grate cucumber and using a clean kitchen cloth, wring out excess liquid. Place into a medium bowl with remaining sauce ingredients. Combine, cover and refrigerate for at least 30 minutes to 2 hours before using. Preheat grill for high heat. Place patties on grill and cook for 4-6 minutes per side or until internal temperature reaches between 160-165 degrees. 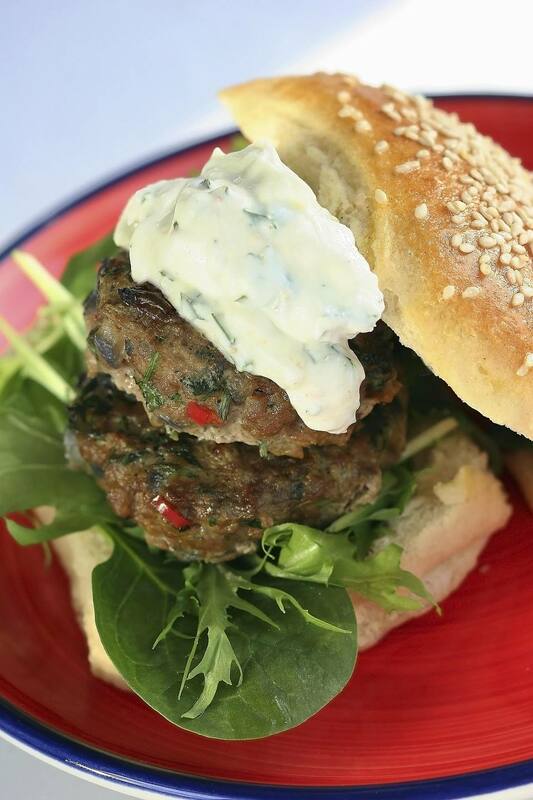 Serve patties on pita bread or toasted burger buns with yogurt sauce on top.